In the current week, some unprecedented successes have been achieved by the heroic Mujahidin of the Islamic Emirate who have inflicted huge financial, physical and logistic losses on both the savage foreign invaders and their internal mercenary forces. In various parts of the country, jurisdiction of the enemy is reduced and siege around the armed forces is tightened gradually. Consequently, the number of the mercenary forces incarcerated or killed and especially those who surrender to Mujahidin of the Islamic Emirate voluntarily is increasing day by day. In various parts of the country, mainly Kunduz province, besides the internal stooge enemy, colossal losses and casualties have inflicted on the brutal foreign occupying forces as well. A number of their high rank officials and fighters have been killed and wounded and a huge amount of their equipment and vehicles have been either destroyed or seized by Mujahidin. Similarly the strategic ‘Lolash’ district in ‘Faryab’ province was liberated by Mujahidin in which heavy financial losses and casualties were inflicted on the stooge enemy forces. The location of ‘Lolash’ district has its own strategic importance and its control and administration is vital and quite significant for Mujahidin because this area is directly connected with various provinces of the country, which significantly helps Mujahidin’s communication and maneuverability in the neighboring areas. ‘Teywora’ district in ‘Ghor’ province has been completely liberated by Mujahidin of the Islamic Emirate as well. Here too, large amount of light and heavy weapons and ammunition was confiscated, the enemy has absconded after suffering heavy losses and casualties and currently the whole area is under the peaceful control of the Islamic Emirate. 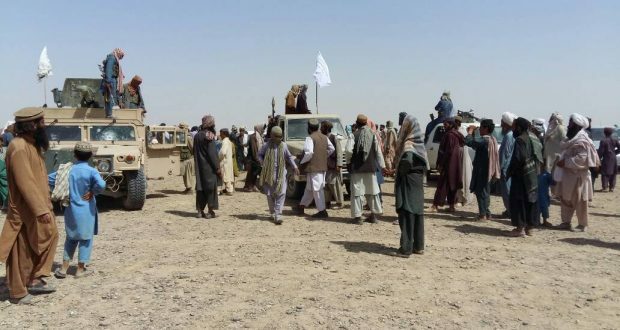 In ‘Shindand’ district of ‘Herat’ province, a huge convoy of the enemy was brought under a successful and meticulous attack of Mujahidin in which more than ten military tanks and ranger type vehicles were destroyed and tens of their forces were killed and wounded. The enemy was forced to retreat after suffering heavy losses and casualties. Most areas in ‘Central Baghlan’ and ‘Pul-i-Khumri’ districts of ‘Baghlan’ province have fallen to Mujahidin and ‘Guzargahi Nur’ district of this province was completely liberated and conquered. In this way, vast areas of this province came under Mujahidin’s control and the white flag of the Islamic Emirate, the emblem of peace and security, was hoisted on all liberated areas. In addition, ‘Pusht-i-Koh’ district of ‘Farah’ province was conquered and controlled by heroic Mujahidin of the Islamic Emirate in which the enemy suffered huge financial losses and casualties. In this conquest too, huge amount of weapons and ammunition was seized by Mujahidin after defeating the enemy and tightening their grip on the area. Overall, the enemy both foreign and their internal mercenary forces have been badly crushed in various parts of the country by losing vast areas, large and small military bases and several significant districts throughout the country after suffering heavy casualties and financial losses. We are certain that by the grace of Almighty Allah, the invading enemy and their internal stooges will be further defeated and crushed by Mujahidin in the near future and the day seems not far-off when the whole county will be liberated by Mujahidin and ruled under Islamic Sharia!! Insha Allah!! !